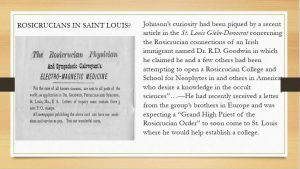 (Slides shown below are taken from the June 2017 pre-conference presentation on Letters the Sage in Albuquerque.) 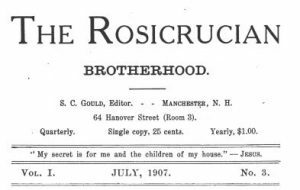 One of the last articles to appear under the name of Alexander Wilder was published in the July 1907 number of The Rosicrucian Brotherhood, edited by Sylvester C. Gould. Gould was allied with Thomas Moore Johnson at the time in a neo-Sufi group that is discussed in the introduction to Letters to the Sage, Volume 1. 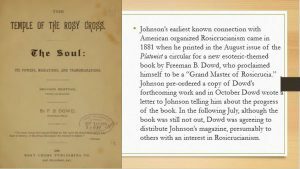 The man to whom Randolph left his group, Freeman B. Dowd, joined the Hermetic Brotherhood of Luxor during Johnson’s tenure as council president. 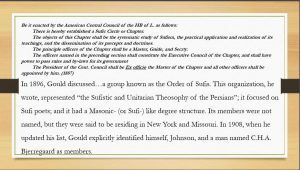 There have been secret fraternities as far back as the history of mankind. All the ancient priesthoods in every country had mysteries and a secret society among themselves. Ancient science was kept carefully hidden. It may have been necessary; some, like swine, tread all learning under foot; others, like dogs, tear the teacher. The Pagans, who after Theodosius, adhered to their worship, hid their secrets, their initiation, and their mystic jargon. I conjecture the magic and witchcraft of the Middle Ages to have been the Mithraic Institute which had been disseminated through the Roman empire. 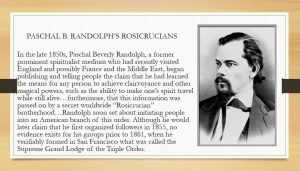 I suppose that the Rosicrucians have existed; I doubt whether there are any now. All of whom I knew that pretended to be such were charlatans. None of our present secret societies antedate that Order; certainly they do not come up to its sublime ideal. There may be something of the kind in the East, but the Moslems have pretty effectually annihilated the most of them. The communes of later date can hardly be considered as heirs or successors of the old brotherhoods. If any test was required to show this it would be found in their love of display, their meritricious exhibitions, and their assiduous endeavors to become notorious. This entry was posted in Uncategorized and tagged Alexander Wilder. Bookmark the permalink.